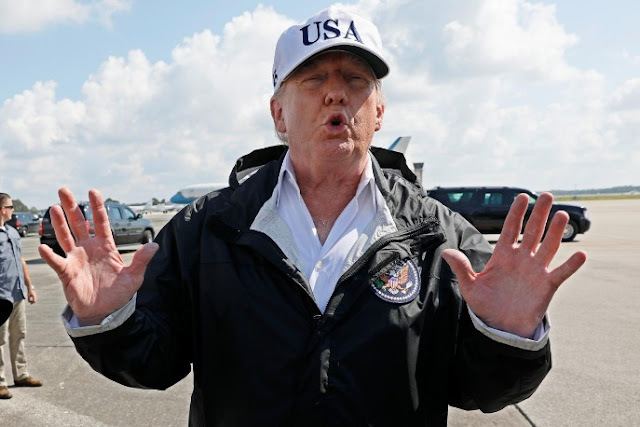 U.S. President Donald Trump talks to the media after arriving to receive a briefing on Hurricane Irma relief efforts and tour storm damage in Fort Myers, Florida, U.S., September 14, 2017. WASHINGTON - President Donald Trump will take his “America First” message to the United Nations next week and seek support for tough measures against North Korea despite his skepticism about the value of international groups like the 193-member body. Nearly eight months in office, Trump will stress his belief in the importance of national sovereignty and the limits of global organizations during his debut as U.S. president at the U.N. General Assembly, an administration official said. White House aides say his address, to be given to heads of state and government or their representatives, is still being written and topics could change. It is likely to touch on North Korea and Iran in addition to the sovereignty theme. Friends, diplomats and foreign policy experts will be watching Trump for any signs that globalists in his White House have gained traction since the departure of nationalist champions such as former chief strategist Steve Bannon. “It will be a good measure of how successful some of the internationalists that he’s gathered around him are being in terms of muting his instincts and replacing them with their own,” said Roger Stone, a longtime Trump supporter. Trump has taken a dim view of international groups before. As a presidential candidate he called NATO obsolete and, as president, during a visit to the alliance headquarters in Brussels, he shocked U.S. allies by failing to underscore his commitment to their mutual defense. Facing criticism, he affirmed U.S. support during a later trip to Warsaw. Trump has called for U.N. reform to bring down “out of control” costs and complained that the United States funds 22 percent of the U.N. budget and nearly 30 percent of U.N. peacekeeping duties. He will host an event at U.N. headquarters on Monday to gather global support for reforming the world body. Diplomats said more than 100 countries had agreed to attend. Still, the president’s tone towards the U.N. has been noticeably more moderate than his criticism of NATO. At a meeting of U.N. Security Council ambassadors at the White House in April, he drew a comparison between the two. “I‘m a budget person. You see the way I’m talking about NATO, the same thing, but if you do a great job at the United Nations, I feel much differently about it because we’re talking pennies compared to the kind of lives and money that you’ll be saving,” he said. Trump drew widespread condemnation for his decision to withdraw the United States from the global Paris agreement on climate change. U.N. officials have criticized him for attacks on the press and for his response to violence at a white supremacist rally in Charlottesville, Virginia. He will speak on Tuesday in front of a wall of marble tiles that as a businessman he described as cheap in 2012. He pledged to replace it with “beautiful large marble slabs” if asked. North Korea fired a missile on Friday that flew over Japan’s northern Hokkaido far out into the Pacific Ocean, South Korean and Japanese officials said, further ratcheting up tensions after Pyongyang’s recent test of a powerful nuclear bomb. U.S. Ambassador to the United Nations Nikki Haley has led the charge for tougher action and further sanctions against Pyongyang. Her willingness to work in the U.N. system was likely to affect Trump’s tone at the gathering, said one European diplomat, who spoke on condition of anonymity. A former reality TV show host, Trump should expect a less responsive crowd than the ones that cheer his message at rallies in the United States, said Elliott Abrams, who was a deputy national security adviser to President George W. Bush. “One thing he’s going to find a bit surprising: it is very much like addressing an audience of the dead. It is not like any audience he’s ever addressed before,” Abrams said. Known for his unpredictability, Trump may surprise. “I don’t even think if he walked up with remarks that we would know what he’d say. I don’t think anybody does,” one former U.S. State Department official said. President Donald Trump will take his “America First” message to the United Nations next week and seek support for tough measures against North Korea despite his skepticism about the value of international groups like the 193-member body.